President John Aufdermauer brought down the gavel at Don Jose’s in Castro Valley, and asked David Gehrke to lead us in the Pledge of Allegiance. REMINDER - resident John let all present know that we have a project going on March 29 when we will be replacing the fence at Banyon House, a FESCO facility . . . 8:00am . . . please confirm attendance with President John! ONLY ONE WEEK LEFT - BE SURE TO SIGN THE REMEMBRANCE BOOKS FOR BOTH MR. TEDESCO AND MR. SHORT . . . the books will be available the next Tuesday for the last time at the Club level, then taken to the District Conference for other notes of encouragement for Mrs. Tedesco and Mrs. Short and their families, and then presented to Mrs. Tedesco and Mrs. Short . . . what a GREAT idea . . . please be sure to come early to sign the books, if possible . . . thanks! SINGING WITH CETA - We “Rowed, Rowed, Rowed our Boat Gently Down the Stream” in honor of our speaker today . . . VISITORS - Rich Lopez (One of the All-Time Greats! 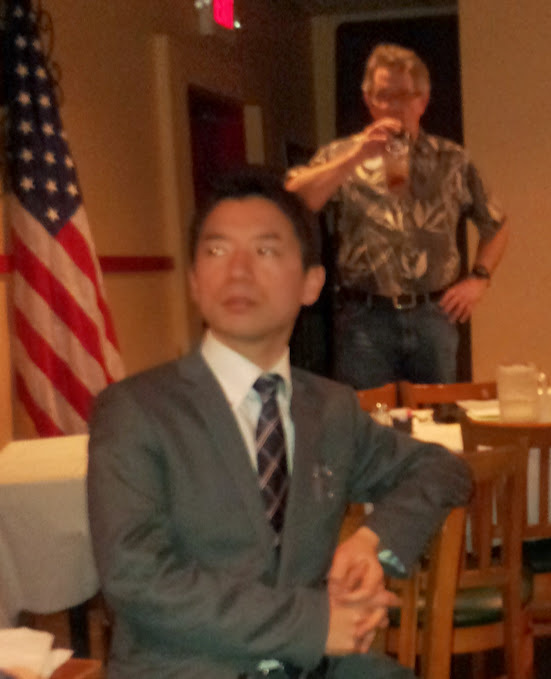 ), Luc (Son of Ceta) Dochterman (who someday will be One of the All-Time Greats), Oakland Rotarian David Sharp, Barbara Forsberg (Assistant to Ray Wallace at CSUEB), and a group of students from Sado, Japan (see below). SPECIAL VISITORS - We welcomed a group of students from Sado Island, Niigata, Japan. 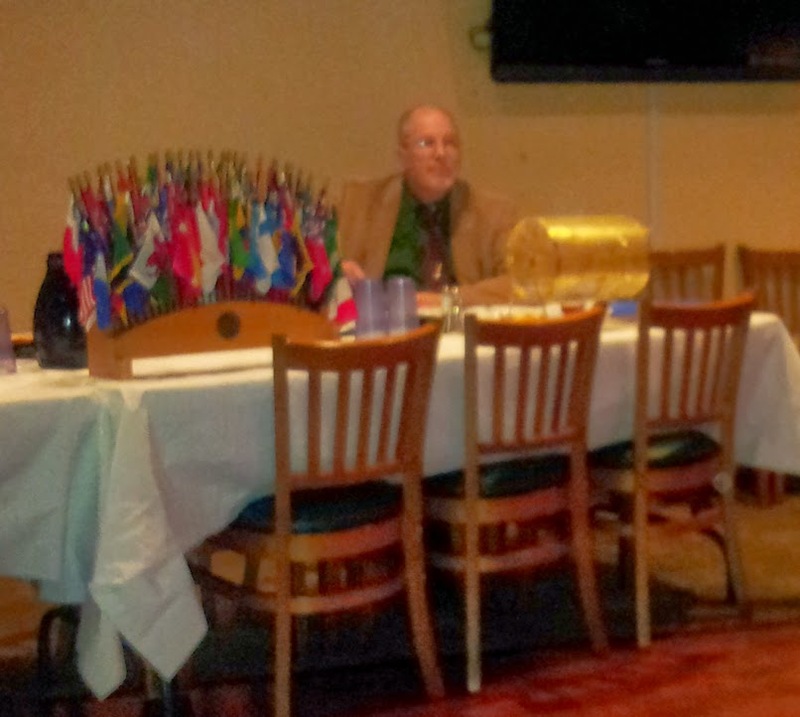 The group met Castro Valley Rotarians and had lunch with them on March 18, arranged by CV Rotarian and CSUEB Executive Director, International Programs Dr. Ray Wallace. The group (four high school students, one junior high school student and their chaperone) came to Hayward on March 15 and will be leaving March 30 as part of an exchange program with Mt. Eden High School. As part of their program, the group were at California State University East Bay March 18-20 for English classes offered by ALP. SAL TEDESCO MEMORIAL HELLO SONG - Luc Dochterman led us enthusiastically. PLANNING COMMISSION UPDATE - Jeff Moore reported that the Daughtrey building is to be sold in 2-3 months. Authorization should be coming along with a Developer. APRIL 11-13 - DISTRICT CONFERENCE, The Dolce Hayes Mansion, San Jose. Part of the celebration will be remembering Rotarians from our District who have passed away this year, including our precious Mr. Short and Mr. Tedesco. Please be sure to register by March 31 . . . PROGRAM - Our program today was Frank Mellon, an annual Rowell Ranch Rodeo Parade participant, who was elected to the East Bay Municipal Utility District in 1994. His topic was addressing the status of the California drought and its effects on the Bay Area. Bottom line: while other water districts are averaging about 44% of capacity, EBMUD is averaging close 61% or 81% of average! This is due to a number of things that EBMUD has done through the years in order to plan for such a time as this. Frank Mellon was elected to the Board in 1994 to represent Ward 7, which includes the areas of Castro Valley, communities of Cherryland and Fairview; portions of San Leandro and Hayward in Alameda County, and a portion of San Ramon in Contra Costa County. He was re-elected in 1998, 2002, 2006 and 2010. Mellon served as vice-president of the Board from 2000-2002 prior to serving as president from 2003-2004. As an EBMUD Board member, he serves on the EBMUD Retirement Board, the Legislative/Human Resources Committee, and as a Board member on the DSRSD/EBMUD Recycled Water Authority (DERWA). Frank’s term expires December 31, 2014. Mellon has a long history of community involvement. He is a former Scoutmaster, a former Cubmaster, and has been District Chair for the Tres Ranchos District of the San Francisco Bay Area Council as well as a Unit Commissioner. Additionally, he is on the Board of Directors of the San Francisco Bay Area Council of BSA. He is a volunteer Director for a retirement facility and is an experienced management trustee on Labor-Management trust funds. Currently, he is a Human Resources and Labor Relations consultant to the public and private sectors. He has provided management training on high-quality employee relations and AB 1825 Sexual Harassment Training for managers. He currently teaches labor law in the California State University East Bay's Human Resources Certificate Program. There he teaches Employment Law; Safety; and Medical Leaves and Employment. A Navy veteran, Mellon graduated from the University of Hawaii with a BA in Management, and from St. Mary's College in Moraga with a MBA. His children are products of the Castro Valley public school system. Director Mellon resides in Castro Valley and his email address is fmellon@ebmud.com. LOOKING FOR THE WHITE MARBLE - With $67 and 13 marbles, Ben Gurule reached into the sack and won . . . $5!